Thursday - Our luxury coach will depart this morning and head for Scotland where we will spend our first night at the Gretna Hall Hotel, in Gretna Green. Comfort stops on-route. Friday - We leave Gretna and travel to Cairn Ryan for our relaxing ferry crossing to Belfast. We will arrive at our hotel late afternoon in County Donegal, with time to settle in before our welcome drinks reception with the hotel manager before dinner. Saturday - This morning, we travel to the Old Courthouse in Lifford for a morning exploring the 18th century County Gael and the gloomy cells that held James Napper Tandy over 200 years ago before his freedom was arranged by Napoleon Bonaparte, himself! We can enjoy a one-hour guided tour of this historic building and partake in a light lunch of soup, sandwiches, tea and coffee in the Bistro. This afternoon we travel to Glenveagh Castle a 19th century castellated mansion in a remote mountain setting. We include a guided tour of this beautiful granite castle before some free time to explore the stunning gardens and impressive visitor centre. Sunday - This morning, we will travel to Omagh and visit a living museum, the Ulster American Folk Park. We will walk through the thatched cottages of Ulster and take a journey on-board a full-scale emigrant sailing ship to the log cabins of the American frontier. Costumed characters help bring the experience to life! We leave the folk park and make our way to the Belleek pottery and visitors centre for a guided tour and an opportunity to purchase some of this beautiful pottery. 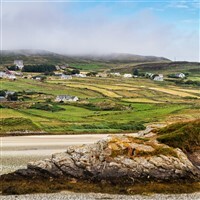 Monday  This morning we are taking you into Donegal and begin our day with a cruise on Donegal Bay you will enjoy full commentary and if youre lucky will spot the seal colony that dominates the bay. Free time after the cruise for a spot of lunch, shopping or an opportunity to explore the 15th century castle that stands proudly in the centre of town. Tuesday  A free day at leisure, this afternoon we include tea and scones in the hotel. Wednesday  We say goodbye to County Donegal and retrace our steps back to Belfast for our crossing continuing back to Gretna for our last night. Thursday - After a full Scottish breakfast we travel back down south to Wiltshire and our waiting taxis ready to take you safely home after an enchanting experience of the Emerald Isles. Luxury Coach Travel with Extra Leg Room. Home Pick Up and Full Hostess Service. 7 Nights Dinner, Bed and Breakfast.